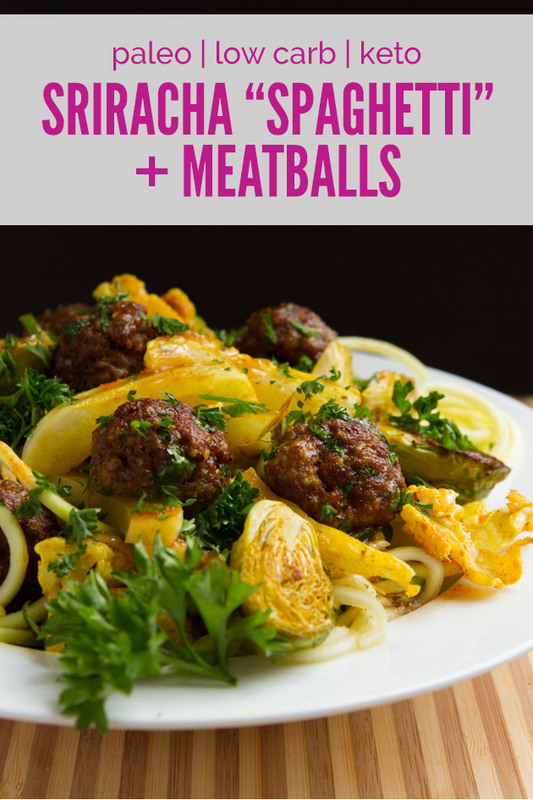 Mini keto meatballs tossed with roasted seasonal vegetables in a tangy keto sriracha sauce. Dropped over freshly spiralized zucchini noodles. It’s this song, converted by yours truly. I really do sing while I cook. Only, I change the words of the songs to the actions I’m doing. If you were here in my kitchen with me, you’d be entertained and well fed. That, I can guarantee. 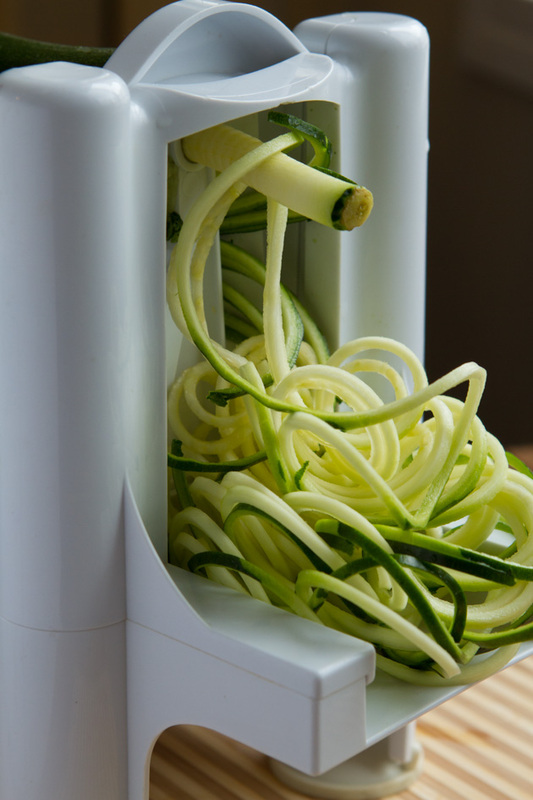 THIS is a spiralizer. It makes noodles out of vegetables – sweet potatoes, potatoes, you name it. And today, it’s making noodles out of zucchini. Compared to zucchini noodles, spaghetti squash loses every time. Every single time. Zucchini noodles taste better, aren’t soggy and are far more satisfying. 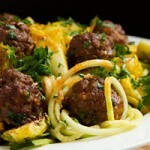 You could use spaghetti squash for this recipe, but why would you want to? 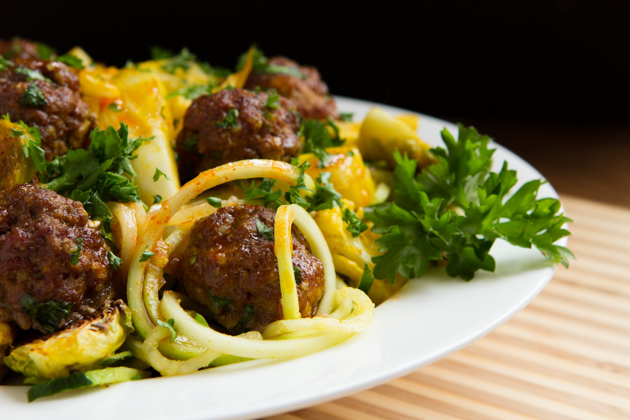 Don’t have a spiralizer? Have $30 to spare? Get one. Don’t have $30 to spare? You could use a vegetable peeler to make thin noodles, then divide them with a knife. It’s a bit tedious and not as awesome, but still something. 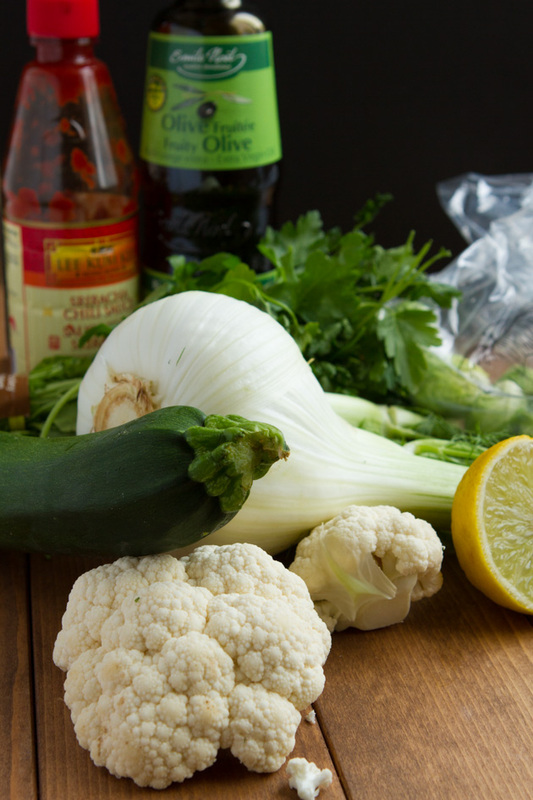 Vegetables: Use any keto vegetables you'd like here. Celery would be nice. Egg: If you're allergic to egg, don't add it. 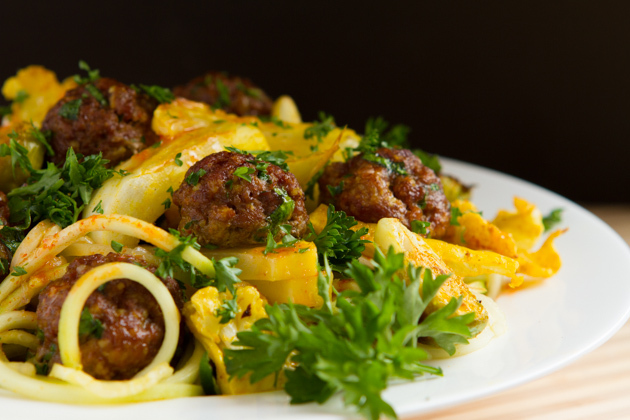 The meatballs are great without it. 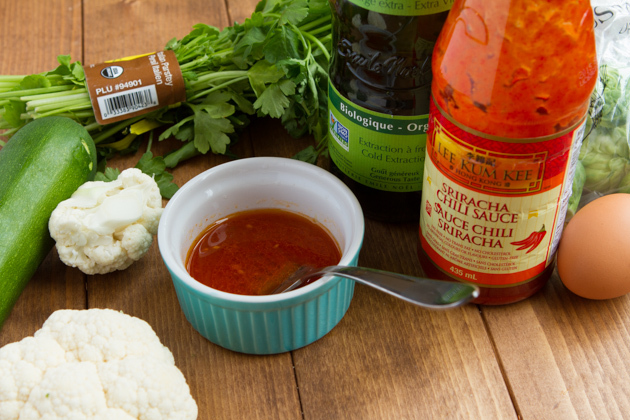 Sriracha: If you don't like Sriracha, you could use red curry paste, too. Or harissa would be good! 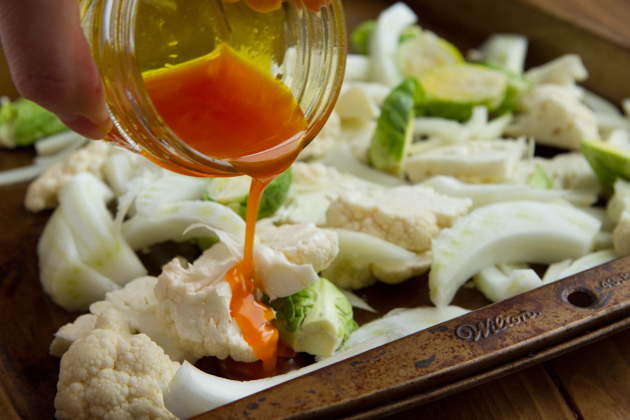 I melted my keto red palm oil to make it easier to toss the keto vegetables in it. If you don’t have red palm oil, coconut oil could be used, too. I just love the flavor that red palm oil gives roasted keto vegetables. 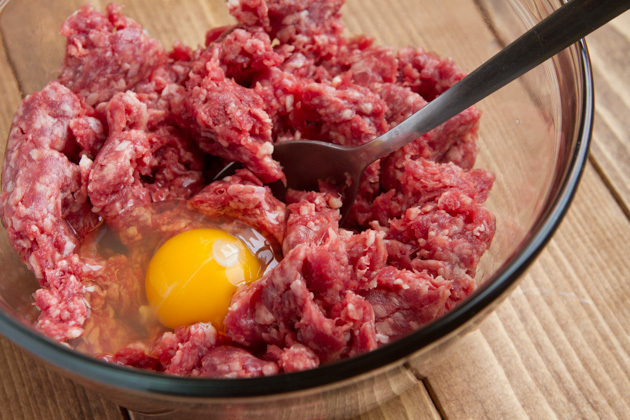 Add the ground meat to a bowl with keto meatball ingredients. I get my grass-fed and finished meats from TK Ranch in Alberta. I used a delicious charcoal-infused sea salt for this keto recipe. Any salt will do, but I love this salt! 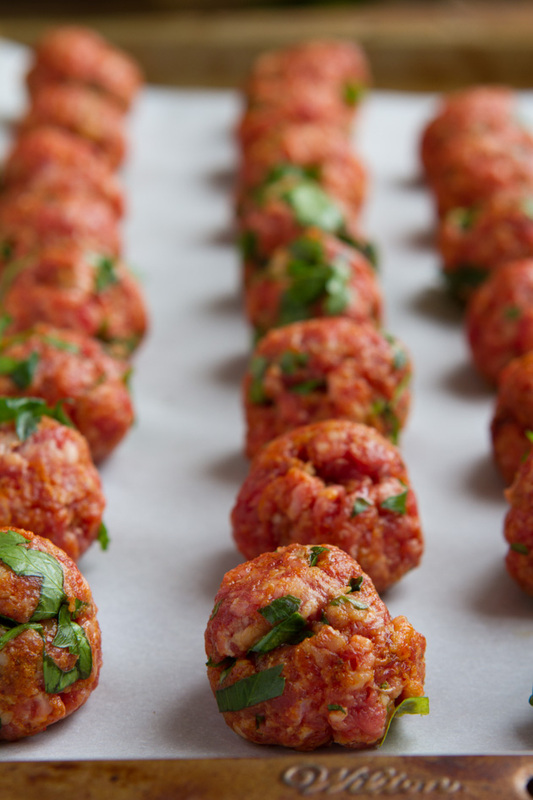 Line up your keto meatballs! It’s a tough call, but if I had to choose 1 favorite kitchen appliance, I’d likely choose my spiralizer. It does so much more than just keto noodles. 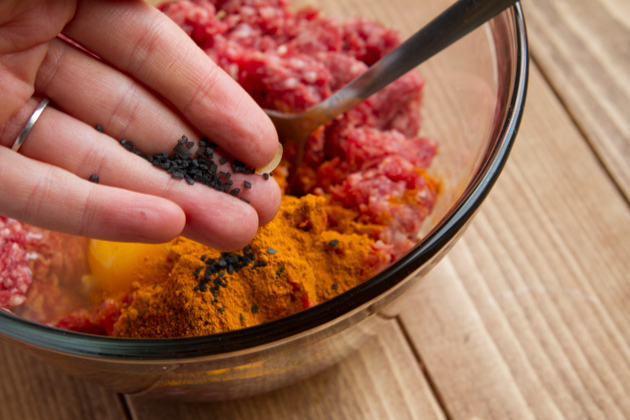 Heck, you can shred up a bunch of keto ingredients, pack it together, and make keto vegetable patties. They’re beautiful fried in coconut oil and served as a keto breakfast. What kitchen appliance is your favorite?